A clever mix of sportiness and class, TAG Heuer Aquaracer watches are made to be practical in water and striking on land. This TAG Heuer Ladies watch is a stunning piece that boasts a 32mm stainless steel case paired with a 60 minute scale unidirectional turning bezel, a screw down crown and a screw in case back engraved with a diving bell decoration. To fasten the timepiece to your wrist, a stylish stainless steel bracelet is added alongside a folding style clasp. Housed beneath the scratch resistant sapphire crystal with antireflective treatment is a mesmerising black mother of pearl dial set with sleek indices and hands coated in glow in the dark Superluminova. As well as its stunning appearance, this TAG watch is also water resistant to 300 metres and its Swiss made Sellita SW1000 automatic movement provides a power reserve of 40 hours and rapid date correction. 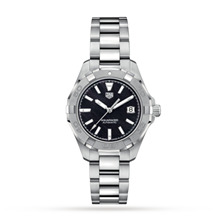 This Aquaracer Ladies watch is further evidence of TAG’s world famous engineering and exquisitely made timepieces.